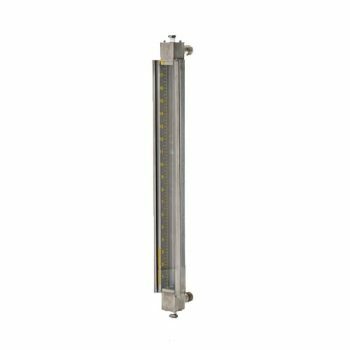 The KENCO Armored Level Gauge (Model ESP or ST) is a rugged tubular liquid level gauge that offers maximum impact from mechanical stress and impact. Product benefits include lower installation costs, reduced maintenance, unobstructed visual indication for your application. The gauge is adaptable to many different types of process connections. Armored frame and 90 degree instrument tees are available in a wide variety of materials. Wetted materials are limited to the O-Ring material, PTFE sight tube holder, and glass. 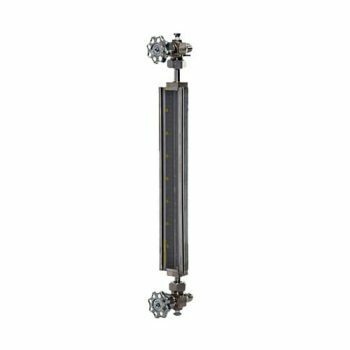 The level gauge will operate in a medium pressure range up to 500 PSI. 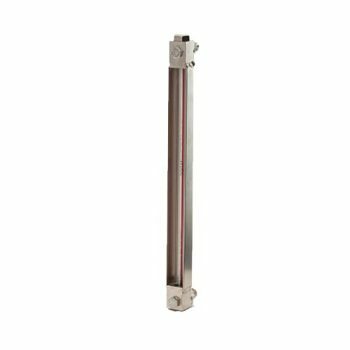 The ESP series offers extra glass protection from an outer tube of polycarbonate, which surrounds the gauge glass. The process piping is supported by the gauge frame. This frame protects the glass tube from mechanical stress and impact. The frame is available in powder epoxy-coated carbon steel, stainless steel, fiberglass, or PVC. The tube holders isolate the process fluid from the gauge frame. They are normally provided in PTFE. Other materials are available, such as type 316 SS or Alloy 20. Standard material is borosilicate glass, however, any clear tubing may be used. Outer protective tube is normally supplied in clear polycarbonate tubing which has a high impact strength (lzod impact range: 12-16 feet, lb./in.). Other materials may be supplied. A one piece gauge is easily installed. 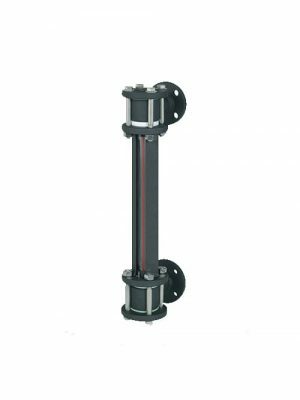 Does not require multiple tank connections or expensive pipe required with reflex type gauges. A one piece gauge has no blind spots and the slotted frame provides see-through viewing of the liquid.